Environment Minister Alex Attwood has pledged to help home-owners whose properties are flooded during the current bad weather. 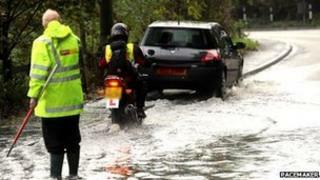 Heavy rain has caused flooding and problems for drivers in various parts of Northern Ireland. The Belfast to Dublin Enterprise train service was suspended due to flooding at Clontarf in north County Dublin. Roads were closed as rivers overflowed their banks with vehicles having to be towed from the flood water. Mr Attwood said he was making emergency funds available to cover council costs in tackling flood damage. Police have warned drivers in Ards, north Down, Castlereagh and Downpatrick to take care on the roads on Monday due to the severe weather. Mr Attwood said he had been liaising with councils to ensure they were able to cope around the clock if necessary. "In the event of the weather situation continuing to escalate and households being hit by flooding, I will look at how practical assistance can be offered to ensure properties are made habitable as quickly as possible," he said. "I will continue to monitor the situation with my officials on an hour-to-hour basis. This is about putting in place the resources at a council level to ensure help is delivered, as soon as possible, on the ground for those severely affected." The worst-hit areas include Ballyclare, Cushendall and north and west Belfast. There were reports of localised flooding in Banbridge, Carnlough, Lurgan and Moira. In Antrim, floodwater caused some damage to a care home on Station Road on Sunday afternoon. "It has been a very wet month indeed and that is really the problem in a nutshell. "Even though we had an inch and a half of rain yesterday which in itself is not unusual, the ground simply can't take any more water and it is a bit worrying that we are going to see more heavy rain moving across the country later this morning and into the afternoon. "It looks as though it will be wet pretty much everywhere but our main concern today is the eastern half of Northern Ireland. "We are going to have to watch very carefully with a view to upgrading the warning level we have at the moment to a higher level, an amber alert. "We could be looking at another inch of rain across eastern parts, perhaps three inches or more across the Mournes by the end of the day, so we are not in a good position to take this water. "There is an enhanced risk of flooding even relative to yesterday." Homes which have been flooded in the past, were again threatened in parts of Finaghy in south Belfast and Edenduff Terrace in Randalstown, County Antrim. Several cars had to be towed out of deep water along the A26 Moira Road. There has also been heavy flooding at the Glenriver estate in Glenavy, County Antrim and on the Keady road on the Armagh side of Beechill. Flooding on the Hillhall Road brought traffic heading towards Lisburn to a standstill. The main Omagh to Plumbridge road in County Tyrone is flooded and there are long delays on the main A6 Derry to Belfast road outside Maghera. "Our rain-bearing systems come from the Atlantic and normally, when the winds are westerly, these systems last three to four hours," he said. "However, this October there has been an absence of westerly winds which means that weather systems moving in from the Atlantic are slow-moving. "As a result, these systems are lasting 24-36 hours, bringing sustained periods of heavy rain. "Does this have anything to do with climate change? The lack of ice in the Arctic at the end of the summer may have contributed to the absence of westerly winds." Anyone needing help should contact the flooding emergency incident line on 0300 2000 100.